All five products have won a total of 6 Gold, 9 Silver and 6 Bronze Awards in Blind Judging Food Competitions. 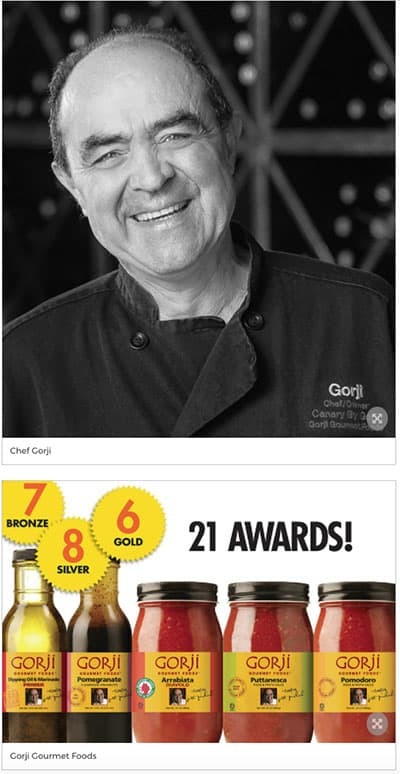 DALLAS, Feb. 8, 2018 /PRNewswire/ — Chef Gorji, of Gorji Gourmet Foods line of sauces for home cooks, is pleased to announce they have won 6 more awards, bringing the total for all five products to 21 awards. The three pasta and pizza sauces swept the cooking sauce category at the Zestfest Fiery Food Challenge, January 29, 2018 held in Irving, TX. Puttanesca won the coveted Golden Chile Award, Arrabiata Diavolo took Silver and Pomodoro won Bronze. Earlier in the season at the Scovie Awards in Albuquerque, New Mexico, Puttanesca won another gold, Dipping Oil Marinade won silver and Pomegranate Vinaigrette won bronze in similar blind judging food contests. Professional judges at both events taste hundreds of sauces, salsas, condiments and treats from across the US and internationally to select the category winners. Puttanesca won two golds, each at different events. It is Gorji Gourmet’s fourth Golden Chile Award: the first for Puttanesca and three for Arrabiata Diavolo. “Taste, texture and flavor are my focal point. It is gratifying to be granted rewards of this magnitude, especially when it is blind-judging,” says Gorji. Chef Gorji developed the Gorji Gourmet Foods line from recipes he created and regularly cooks with in his kitchen at Canary By Gorji. Gorji Gourmet Foods help home cooks easily make gourmet tasting dishes without hours of preparation. Arrabiata Diavolo: the spiciest. It adds zesty heat to pasta, pizza, seafood, burgers, bloody marys and wherever the devil makes you do it! Dipping Oil & Marinade: olive oil that is perfect as a dipping oil or as a marinade for all kinds of meats, fish, poultry and vegetables. Chef Gorji uses this exclusively in his kitchen at Canary By Gorji. They can be purchased at Canary By Gorji restaurant, Whole Foods, Jimmy’s Food Store and Royal Blue Grocery in the Dallas area. They are available online at Amazon and GorjiGourmet.com. Gorji has been chef-owner of Canary By Gorji, an intimate 8-table restaurant in Dallas, TX for almost 15 years. He is back-to-back champion of the famed Texas Steak Cook-Off in Hico, TX 2004/2005. He has published a debut cookbook, Zing! featuring his signature “New Mediterranean” cuisine. Gorji Gourmet Foods were created in 2006. No Replies to "Gorji Gourmet Hits 21"